Oh my! This is SO my kind of dinner! This seriously tastes like healthy summer on a plate. 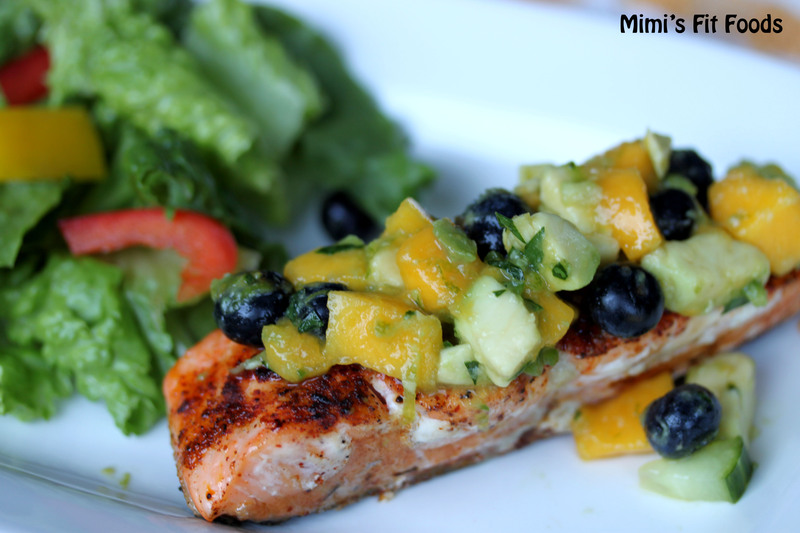 The salmon is simply seasoned with chili powder and the salsa is sweet and fresh. Of course the chili powder is a fabulous compliment to salsa, so it’s no wonder this all goes together beautifully. The salsa is seriously SO good! It’s so good that it’s kind of a little bit hard not to eat more than the appropriate portion size. (You’ve been warned!) I was pretty intrigued with the addition of blueberries in this salsa. I’ve made and seen several variations of mango salsa, but none that included blueberries. Let me tell you, it’s awesome! The burst of the blueberry in the mouth along with the sweetness and tartness of the berry is a perfect compliment to the soft and sweet mango. The cucumber adds a nice balance to the sweetness as well as good bulk to the salsa (without adding many calories). You can’t have a salsa without some kind of pepper, so there is a jalapeño pepper in here and you can add as much as you want. The majority of the heat comes from the ribs and seeds of the pepper so for a mild salsa, remove all the ribs and seeds, for a hot salsa, keep them in. The avocado adds a richness and creaminess to the salsa that helps to made this stuff so addictive. Last, but certainly not least, is the addition of lime zest and lime juice. This gives the perfect amount of acidity and zing to the salsa and makes it taste amazingly fresh. This meal can be eaten for lunch or dinner. We had it for dinner with a side salad. I think I might start making the salsa for snacks and appetizers too. It’s that good! For the Salsa: Toss all salsa ingredients in a medium bowl until well mixed (I use a rubber spatula so that the avocado doesn’t get mashed). Set aside. 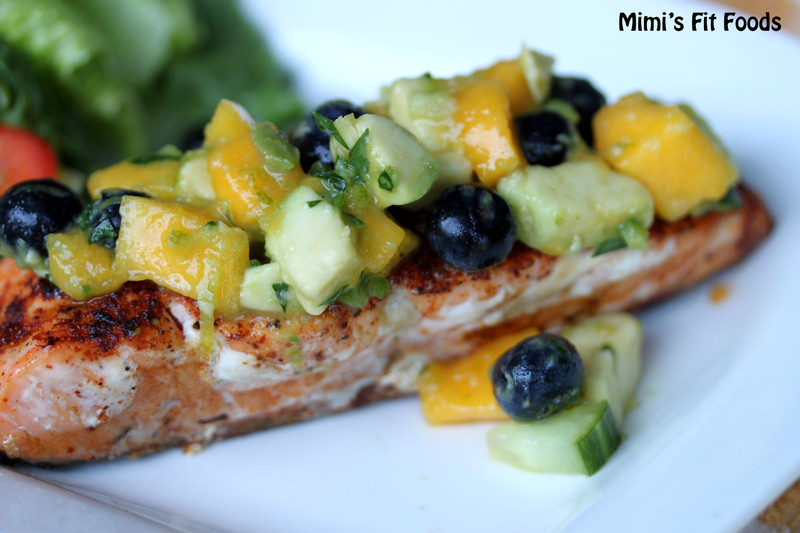 For the Salmon: Preheat a grill (outdoor or indoor . . . I used a charcoal grill for mine) to medium-high, and season lightly with olive oil. Sprinkle 1/4 teaspoon chili powder over each of the salmon filets. Season with salt and pepper, and place, skin-side down. After 2 to 3 minutes, flip, and continue to cook on other side for an additional 2 to 3 minutes, or until it reaches an internal temperature of 130F.